Madonna took the industry by the scruff of the neck, made opportunities for other women, like Gaga and Katy Perry. Fanfire is currently offering discounts on Madonna items. Looking for the new 2013 calendar, posters or tourbooks, head on over to the Madonna store! Here’s the two page ad from the “Truth or Dare by Madonna” footwear line featured in the September issue of InStyle. Big thanks to Boy Culture! Gossip’s Beth Ditto chats with us at V Fest 2012 about nerves over releasing her latest album, her desire to work with Madonna, updates us on her wedding plans and discusses gay role models in pop music. 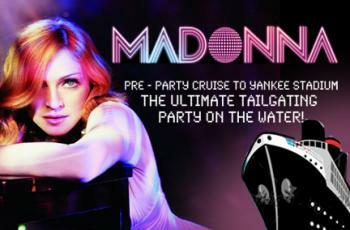 Madonna Pre Party CRUISE to Yankee Stadium! During “Like a Virgin” Madonna encountered a small problem with the corset. Madonna and the MDNA Tour crew all had a big paintball event for Rocco’s birthday! What better way to celebrate Madonna’s career then by getting her first single to hit #1 on itunes, 30 years after it was released! On October 6th 2012, it will be 30 years since Madonna put out her first single “Everybody”.